I’ve had this problem on a couple of machines now, both were running Outlook 2007 SP3. Outlook appears to be working normally, but if you try to access the calender it just hangs and displays “not responding” in the title bar. Eventually you are left with no choice but to close and restart Outlook. There seems to be several problems with this, and therefore several possible solutions. 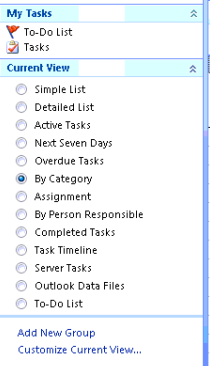 It seems that the default calendar view also shows the task list, and I found the tasks to be where the problem originated from, and in both cases the tasks were incomplete and not correctly filled out. Not only was I unable to click on these tasks, but they were constantly refreshing like they could not be properly found. By changing the view I was able to get a stable view of the remaining tasks. Deleting the rogue tasks, which were flagged as incomplete, but many years old solved the issue. The calendar became accessible again. I spent quite a long time trying various fixes to this quite basic fault in Outlook, quite a few others have experienced almost the same problem as me, so hopefully this saves someone else some time. I tried what the post says but no luck so as I was looking at tasks windows I realized that I have added a pst file from a network location so I thought “maybe the issue is ’cause it is looking and reading that file so as a result it’s hanging then I closed those files I had and the problem went away at least by now this fixed my problem and Outlook 2007 has came back to work! Hope this helps anybody else if the post doesn’t. Well done Leonardo, glad you got it sorted. I’m sure your suggestions will help someone else out there too. There seems to be a number of things which can cause this hang. Hopefully we can catch them all. Thanks Paulie, that worked. My calendar is no longer freezing when I try to open it. I deleted some open tasks in the task file as you recommended. Thank you for a set of very clear instructions which actually work!! Brilliant thinking! Excellent post, in my case it was the tasks that were the issue. Changing the view to “by category” and then marking them as “complete” sorted everything out and I could access the calendar again. The only thing I had to do differently was right click on the “arrange by” tab to change the view as when I did not get the full list of options below the current view pane. It took me a week of searching the internet to find this page. It worked great. The good news is during the week I found out about Outlook Tools 2.3 which help me clean up some other issues. A big thank you for your article on “Outlook 2007 calendar crashes” etc. I took your advice and looked at Tasks and there was the problem. I can now open calendar. Again many thanks. Deleting old tasks did the trick. Thanks! Thank you for the fix it worked. Sometimes, corrupt Outlook profile is a major cause of crash in Outlook 2007 calendar items. It can be solved through ScanPST.exe but it doesn’t ensure successful recovery of the data. In such cases, you can try professional software like Stellar Outlook PST repair, which is also compatible with Outlook 2016 on Windows 10 platform. Thanks it’s working after changed the tasks current view. Thank you for the tip. Deleting old tasks fixed the problem. I’d pruned old E-Mails from a pst-file, but some tasks were left which referred to deleted items. I tried many options, to no avail. Starting Outlook with command line switches helped. Thanks a lot is not enough to say.